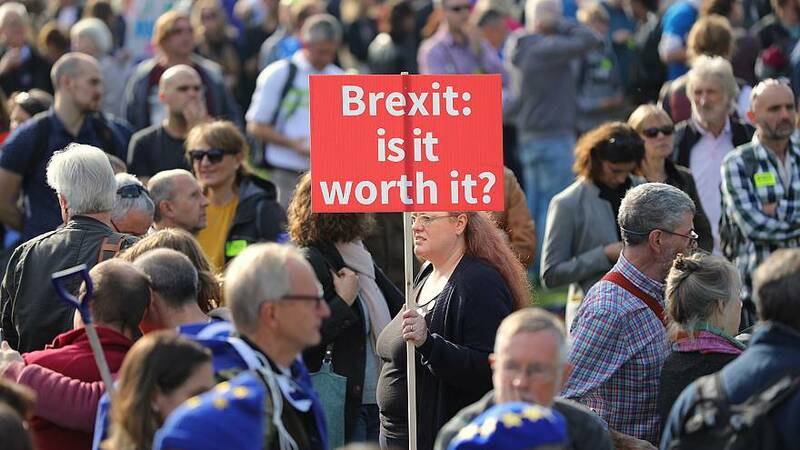 LONDON — Thousands of protesters were gathering in central London on Saturday to call for a second referendum on Britain's exit from the European Union. London Mayor Sadiq Khan was among those set to address the People's Vote March, which culminates at a rally in Parliament Square. Organizers expect the protest to be the biggest of its kind, with about 150 buses ferrying thousands of activists from across the country to the capital. Britons voted to leave the trade bloc by a narrow margin in the 2016 EU membership referendum. Prime Minister Theresa May has ruled out another public vote on the subject. Britain is scheduled to leave the EU on March 29, but negotiations have been plagued by disagreements, particularly over the issue of the Republic of Ireland-Northern Ireland border, which will be the U.K.'s only land frontier with the EU after Brexit. There are growing fears of a "no-deal" exit, which could create chaos at the borders and in the economy. Prime Minister Theresa May said at an inconclusive EU summit in Brussels this week that she would consider a longer post-Brexit transition period — one that could keep Britain aligned to EU rules and obligations for more than two years after its March departure. Pro-Brexit politicians in Britain saw it as an attempt to bind the country to the bloc indefinitely.